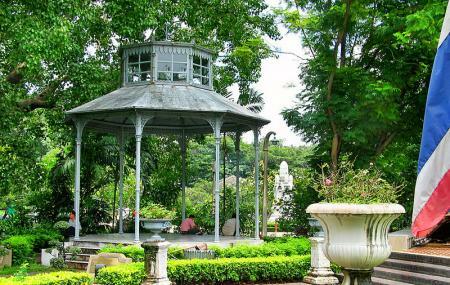 Located opposite to the Grand Palace in Bangkok is the Saranrom Park. This park was originally built by Rama IV in 1866 and was a part of the Grand Palace. This park was then then passed down generations and it was Rama V who turned this park into a zoo. The animals were moved here from Dusit when Rama V built the new royal city. Later, this zoo was handed over to the foreign ministry and was used for the stay of foreign dignitaries who were visiting the kingdom. This park was also the meeting place for the coup of 1932 which brought end to the monarchy in Thailand. Today, visiting this park will give you a good break from the bity’s hustle and the many walking trails here will serve you an opportunity to take a nice, relaxing stroll. Do not touch any plants. Look out for the two Komodo dragons in the pond. How popular is Saranrom Park? People normally club together Snake Farm and Siam Relax Thai Massage while planning their visit to Saranrom Park. A lovely little park, I discovered whilst taking a different route to Wat Pho. Well maintained, with trees , flowers, ponds, a good place to relax. Plenty of monitor lizards, fish, and a wide variety of birds to observe. Perhaps most importantly, there are public toilets there ! A nice, chill place in the heart of the city. It's a good place to sit down in the shadows after a long day of walking around in the city. There were different animals as well. Beautiful peaceful park. Went there a couple of times during my stay in Bangkok. Probably the best park out there. It's small and really quiet. Good place just to escape the chaos of Bangkok. Houses some beautiful animals and is really clean.